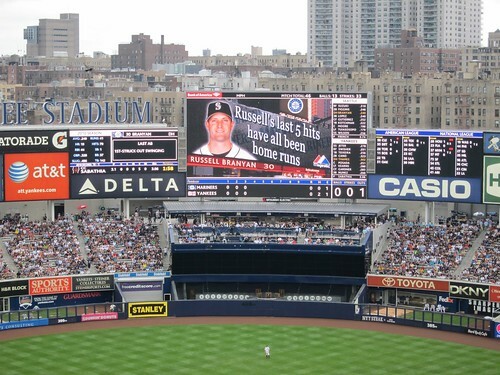 It took me almost two seasons, but on Sunday afternoon I finally made the trip to the South Bronx to see a baseball game at the new Yankee Stadium. It was the final game of a three-game series with the Seattle Mariners and though the forecast called for rain, I hoped we'd be able to see at least five or six innings. My friend Amanda Rykoff had an extra ticket and offered to show me around the new ballpark. Check out her post about the game. 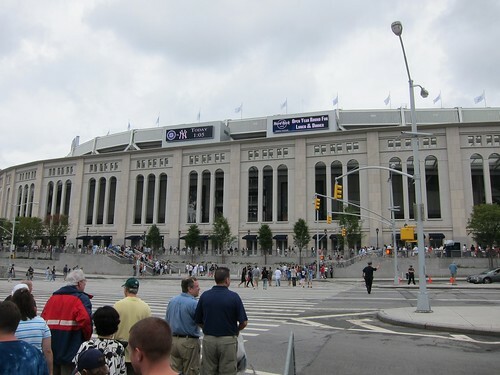 My last visit to the neighborhood had been in November 2007, when I had a tour of the old Yankee Stadium. The walk up to the new park is much more impressive, with better traffic flow than the crowds that milled around outside on the sidewalk. 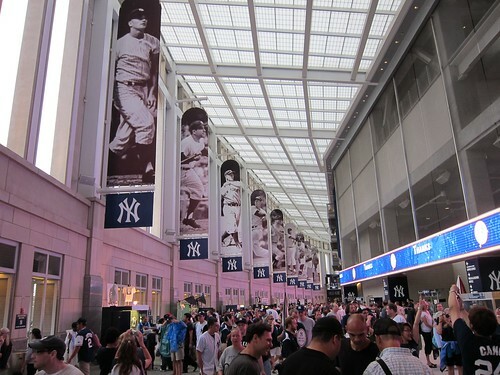 The entrance led into the Great Hall, with banners honoring famous Yankees. It's a bit overwhelming. 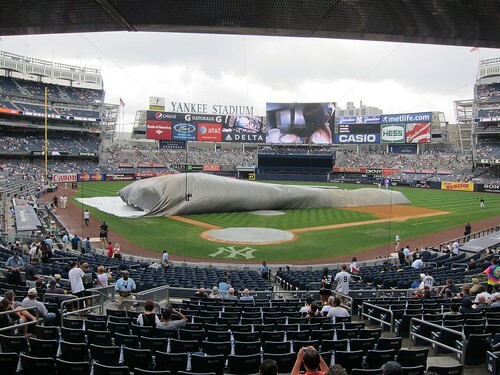 The tarp was on the field when we arrived, but they removed it a few minutes later. The game was going to start on time. Our seats were in section 420B, high above home plate but with an excellent view of the entire field. 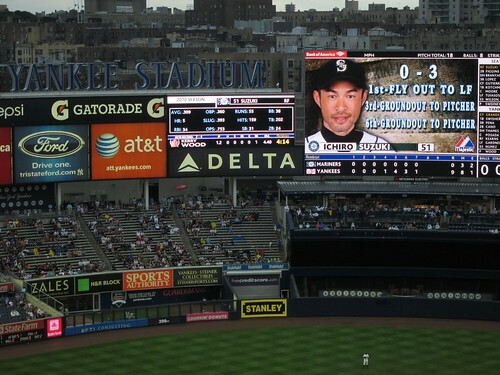 The high-definition video screen was directly in front of us and despite the distance every line and statistic was easily readable. CC Sabathia was pitching for the Yankees, and he threw a magnificent game with eight strikeouts through six innings. 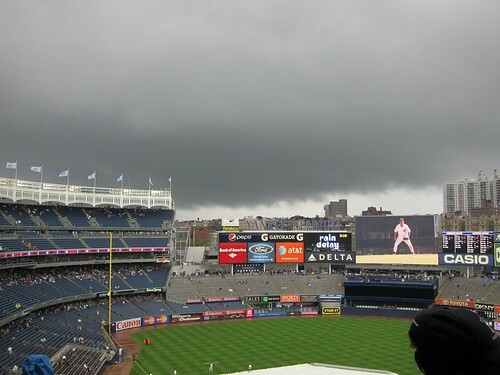 The Yankees took a 1-0 lead as the rain started. 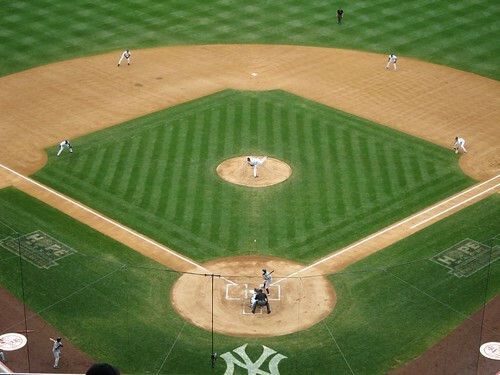 Then, in the bottom of the fifth, Robinson Cano hit a grand slam to give the home team a 5-0 lead. It wasn't as exciting as the 10th-inning walk-off grand slam by the Pirates' Pedro Alvarez against the Rockies two weeks ago in Pittsburgh, but it was fun to watch the crowd's reaction. A few minutes later a rain delay suspended play for 45 minutes. Amanda and I retreated to the concourse, tried the sausage sandwiches (tasty!) and met up with her friend Stefanie who had provided us with our tickets. The rain kept me from exploring more of the food options on the upper level, so I'll have to see what's there at my next game. 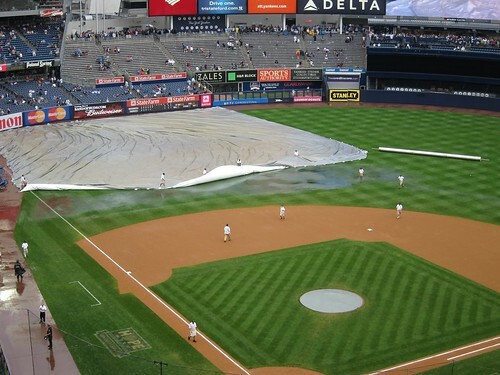 When the rain eased up the tarp came off again and the grounds crew made short work of those puddles. They used squeegees and some sort of shovel/corer thing to punch drainage holes in the turf. Within five minutes most of the water had drained off. At 3:30 the game was back on, though Sabathia's day was done. The Yankees' bullpen finished up the shutout, although Joba Chamberlain gave us a little to worry about with a runner on 3rd late in the game. We kept hoping for a pitcher's ERA to match the time of the game, but the closest we got was Kerry Wood's 4.40 at 4:15 PM. The Mariners weren't able to mount anything close to a comeback and even with the rain delay the game ended around 5 PM. And we lucked out with the rain -- the worst of it came down during the game when we were under cover. I had a great time at my first game at the Stadium. Because of the weather I didn't get to explore it as much as I would have liked, but I'll see more of it on future visits. 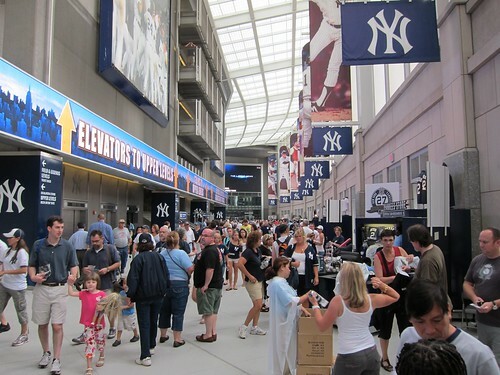 As much as I derided the Yankees for spending more than $1 billion on their new home, the money was well spent. It's a gorgeous place to watch a game. 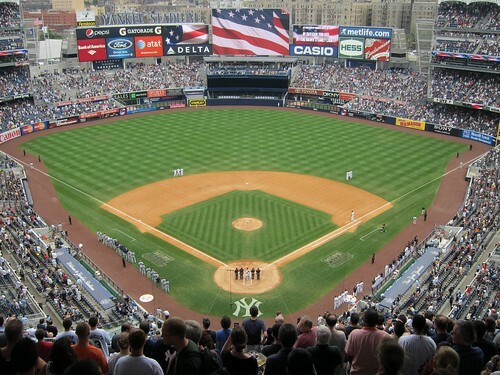 I'm going to a Mets-Pirates game at Citi Field next month so I'll be able to compare the other new stadium to this one.